Ref No Grave or Memorial / Rhif cyfeirnod bedd: In West part of old ground. The 1901 census sees them living in Ewloe, Hawarden, Flintshire. Thomas, 28 was a Coal Miner, Hewer and like all the family had been born in Hawarden. His wife Elizabeth was 26. Their eldest son Edward J. Wainwright was 5 and his siblings were Mary R, 4 and Eugenia, 2. Elizabeth’s brother, Charles Davies, 9 and her father John Davies, 58, widower and a Gardener were also in the household. The 1911 census records the new family living in Chapel Row, Ewloe, Near Chester, Flintshire. Thomas, 38 was still a Coal Miner Hewer. He stated on the form that that 4 children had been born to him and they were still living. His new wife Mary Elizabeth, 34 was written in at the bottom of the entries as “Second Wife” (Married 2 years) and she had been born in Hawarden. The listed children were Mary Elizabeth, 14 a Domestic General. Servant, Edward John, 15 was an Iron Worker Scrap Boy, Eugnie 12 was at School and Thomas Albert was 7. Thomas’s brother-in-law Charles Davies was 19, a Coal Miner, (Haulage). Click on the link to read his story as he too died in the war. UK, Soldiers Died in the Great War, 1914-1919 accessible on www.ancestry.co.uk confirms Edward’s regimental details and tells us that he enlisted in Buckley. It also tells us that he died of wounds at home. His medal card, also on ‘Ancestry’ details his medals and tells us that his first Theatre of Ward was France and he entered it on 2nd December 1915. 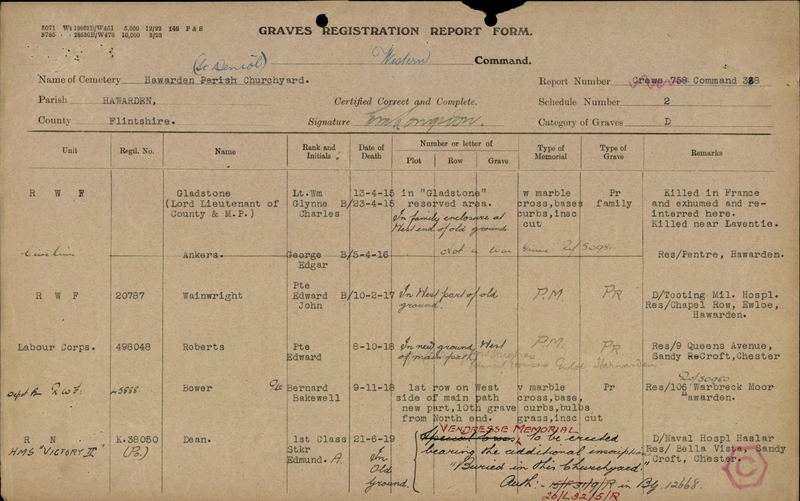 There is an index card for Edward in The Flintshire Roll of Honour at The County Record Office in Hawarden. ( Card Ewloe F11) It tells us that his period of service was 2 years, 2 months and that he died of wounds. The card was signed by Thomas Wainwright on the 16th October 1919. On the same day he signed his brother-in-law Charles Davies’s card. Edward is buried in St Deniol’s Churchyard in Hawarden. The inscription on the family grave tells some of the family story. 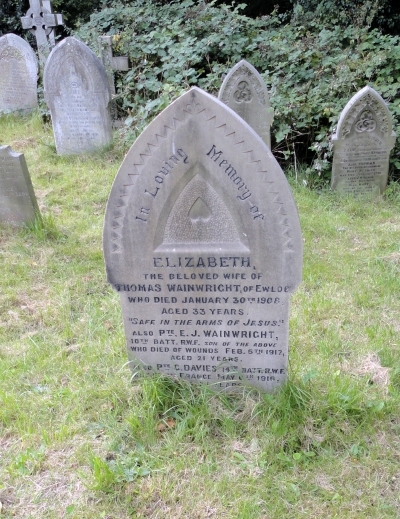 who died January 30th 1908 aged 33 years. who died of wounds Feb 5th 1917 aged 21 years. Also Pte. C. Davies 14th Batt R.W.F. Killed in France May 6th 1916 aged 24 years. This website has recently started and will be ongoing, so perhaps some more of the local soldier’s wills will be on it. The cost is £10 and can be ordered online. This is an amended version of Edward John’s family history and now I know that there were 3 brothers and 1 cousin who sadly died in the Great War. Edward John being the cousin.